Photograph depicts the early settlement of Fort George. The buildings to the left of the fence are believed to be owned by the Hudson's Bay Company. The land to the right of the fence belonged to the Fort George Reserve, the home of today's Lheidli T'enneh Band who relocated to a reserve at Shelley when this reserve was sold in 1912. 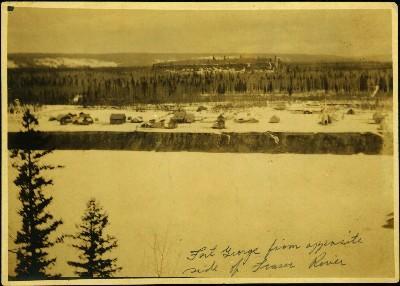 Handwritten annotation on verso and recto of this photograph reads: "Fort George from opposite side of Fraser River". Item is part of the Taylor-Baxter Family Photograph Collection. Item is one of 31 photographs portraying Bourchier's supply freight transport business, see also items 2009.5.3.1 - 2009.5.3.31. See also item 2009.5.3.29 for related photo.